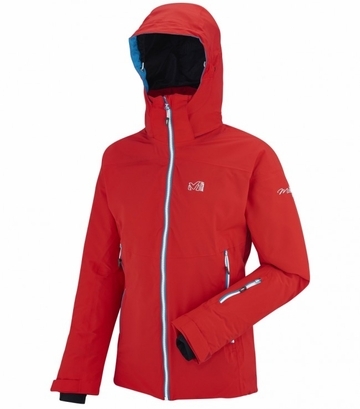 A high tech design with lots of protection and cozy comfort for your backcountry adventures, this jacket is built for ski or snowboard. Made of a soft and stretch 2-layer Gore-Tex, the Curve is insulated with Primaloft Black, keeping you warm when it matters most. A brushed tricot lining at the back, collar and chin-guard adds comfort and wicks moisture away from the body. 2-way opening pit zips venting will allow the extra heat to escape to keep your comfort at best. Even your smartphone will get protection: a warm pocket with a media cord system will allow you to use your device in action. An integrated powder skirt is joined to a stretched fabric band and links with the pant with a 3-points system to create a barrier against snow without losing mobility. On the top end, a high fitting collar with a removable hood will protect you from the wind and the snow. You can find the perfect color combo for you, let it be an active, pop color or a tonal, softer style.